The TS-512 screener features two high-energy, two-bearing decks; a 12 by 5 ft top deck and a bottom deck that is 10 ft, 4 in. by 5 ft, giving producers ample screening area of 112 ft2. The interchangeable screen media gives producers versatility over end product size. The unit optimises productivity with its 12 yd3 hopper and 100 hp CAT Tier 3 engine that enables the screener to process as much as 400 tph of material. The TS-512’s three conveyors sort as many as three sizes of product into stockpiles 16 ft, 5 in. high. 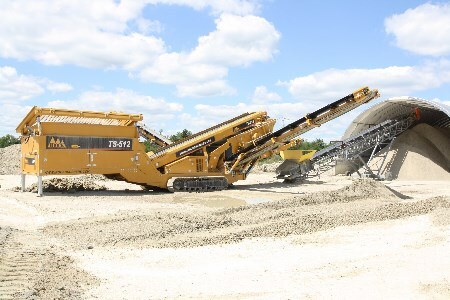 The TS-512 is the tallest in the industry, which allows operators to put more material under the belt before moving the screener from one stockpile to the next. Users can set up and tear down the screen fast and easily. Many components, such as the conveyors, are hydraulically powered so operators quickly and simply move them into place for production or fold them down for transportation. The TS-512 also features intuitive, easy-to-use controls to further enhance efficiency. IROCK built the TS-512 to withstand the rigors of day-to-day use. It features a solid, heavy-duty steel chassis that provides ultimate durability on the site and during transportation. Customers can choose the standard tracked model that optimises manoeuvrability around the jobsite or the wheeled version for fast and easy towing. Maintenance is simple with the TS-512’s easy-to-access engine compartment that provides generous room for repairing or replacing components. IROCK offers several additional features to customise the unit for specific applications. An optional remote-controlled livehead effectively sizes and loosens heavy, dirty and sticky debris from product before it enters the hopper. This expedites the screening process and boosts productivity. Users choose from the standard tethered remote or IROCK’s optional wireless remote for greater flexibility around the site. A crusher chute, gives producers the option to directly feed material into the hopper without removing the tipping grid. A single shaft shredder is also available for proper topsoil screening.